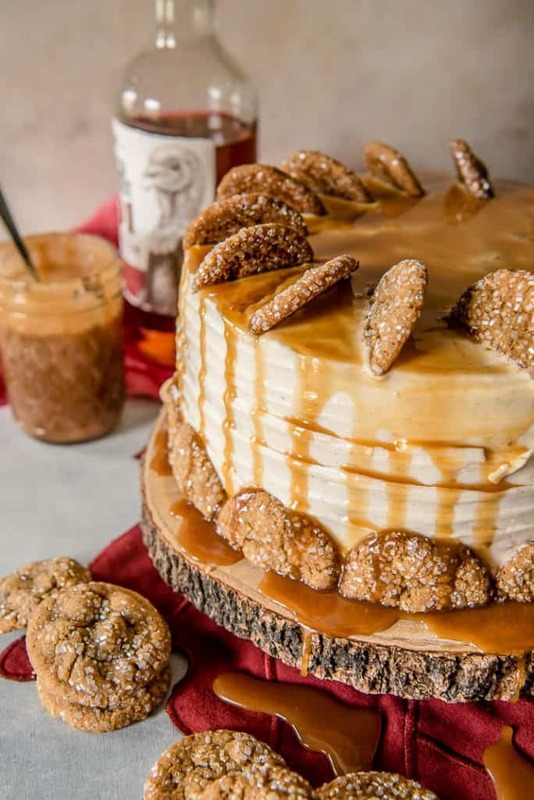 This Bourbon Caramel Spice Cake is full of fall flavors – covered with a caramel bourbon cream cheese buttercream and garnished with gingersnap cookies, it’s perfect for any celebration. Talk about a fall explosion. 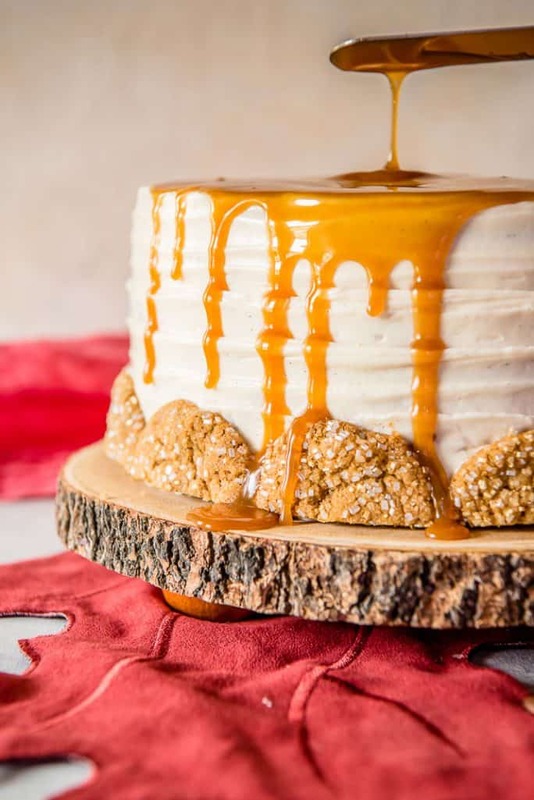 Even though our last fall holiday of the year has come and gone, I couldn’t miss the chance to share this oh-so-extra delicious cake with you guys! It’s everything good and naughty about fall and you are going to LOVE it! And I promise it will be welcome on any Christmas dessert table it ends up on, too. 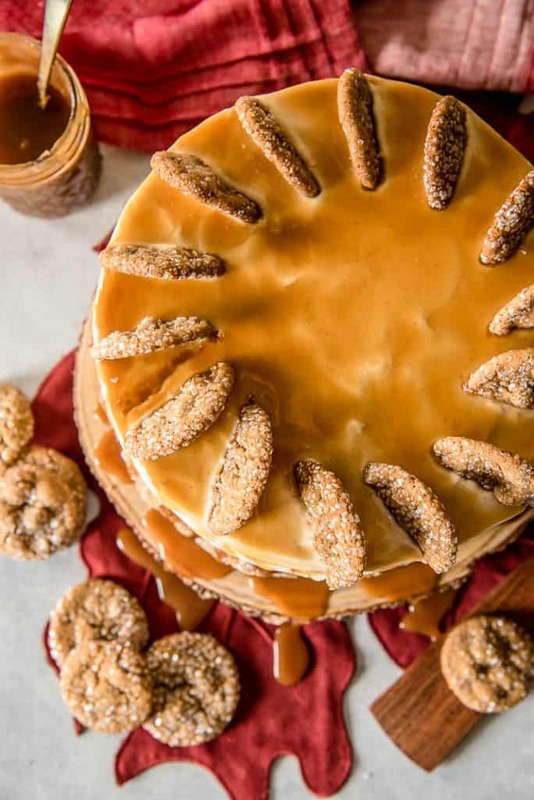 JUST TAKE ME TO THE BOURBON CARAMEL SPICE CAKE ALREADY! 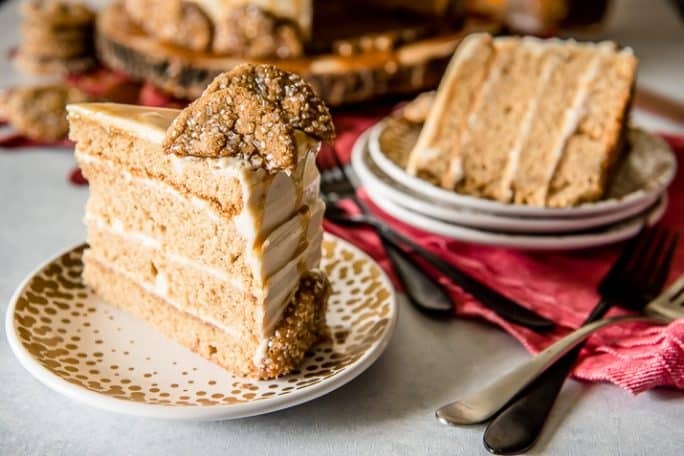 If you’d rather skip my (pretty darn helpful) tips and tricks, essential cooking info, and similar recipe ideas – and get straight to this delicious spice cake recipe, just scroll right on down to the bottom of the page where you can find the printable recipe card! I’ve been on a real bourbon caramel kick this year, which is kind of surprising since I am a habitual caramel ruiner. 2 out of 3 times, I end up with burnt caramel, which is not totally unpleasant, but is definitely an acquired taste. 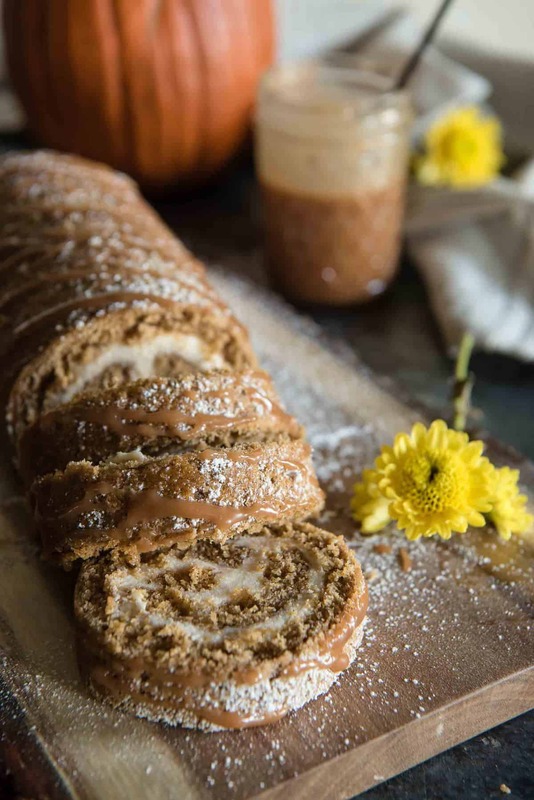 With a miraculously successful batch, I created this gorgeous Bourbon Caramel Spice Cake along with the Bourbon Caramel Pumpkin Cake Roll that I posted last month during Pumpkin Week. It was a huge hit with my hubby…who ended up eating most of it in just a couple of days! 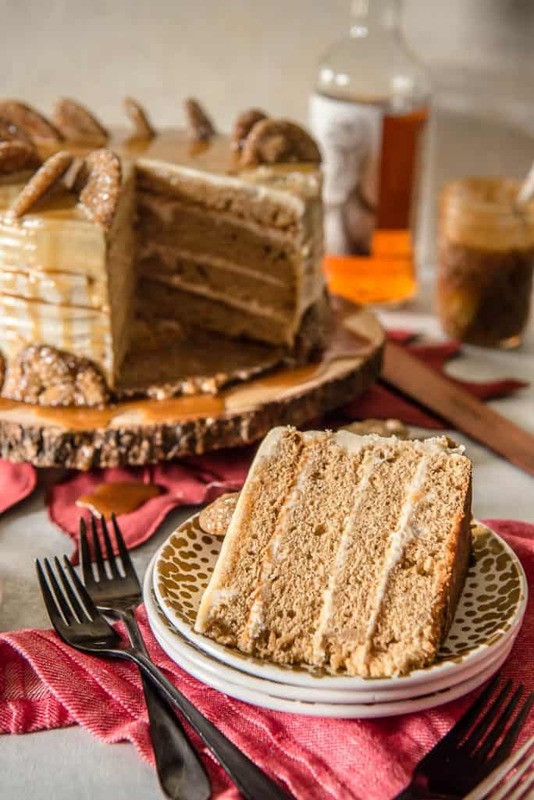 The cake itself is a tender spice cake, loaded with your favorite fall spices – it reminds me a lot of the cake slices we used to get in the school lunchroom. Only this has bourbon in it. And it’s slathered with the tastiest bourbon caramel cream cheese buttercream you will probably ever put in your mouth. To top it all off, I covered it with even more caramel. Just make sure your sauce is cooled a bit more than mine was. It got a little messy as it dripped down the cake, and the dramatic effect I so wanted wasn’t quite achieved. Don’t forget the gingersnaps on top! 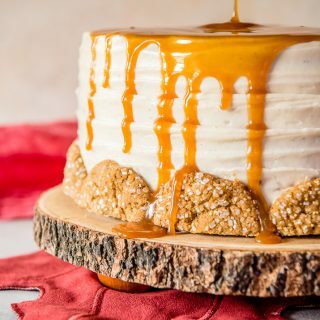 This Bourbon Caramel Spice Cake is full of fall flavors - covered with a caramel bourbon cream cheese buttercream and garnished with gingersnap cookies, it's perfect for any celebration. Preheat the oven to 350°. Butter and flour two 8-by-2-inch round cake pans. In a large bowl, sift the flour together with the baking powder, spices, and, salt. In a stand mixer or with a hand mixer, beat the butter until creamy. Add the brown sugar and molasses and beat 4 minutes until light and fluffy, scraping down the bowl as needed. Add the eggs, 1 at a time, beating well after each addition. Mix in the vanilla and bourbon. Beat in the flour mixture on low speed in 3 batches, alternating with the buttermilk, until the batter is just combined. Divide the batter evenly between the prepared pans. Bake for 35 to 40 minutes, or until a toothpick inserted in the center comes out clean. Let the cakes cool for 10 minutes, then turn each out onto a cooling rack and let cool completely. Wrap each cake in plastic and store at room temperature overnight to develop the spice flavors. When ready to decorate, use a long serrated knife to cut each cake layer in half horizontally. Set on a work surface, cut side up. Center 1 bottom cake layer on a cake board or plate. Spread 1/2 cup of the Caramel Cream Cheese Buttercream on top, then cover with another layer, cut side down. Repeat with the remaining cake layers and buttercream. Crumb ice the cake, then refrigerate for 15 minutes. Completely cover the cake with the remaining buttercream. 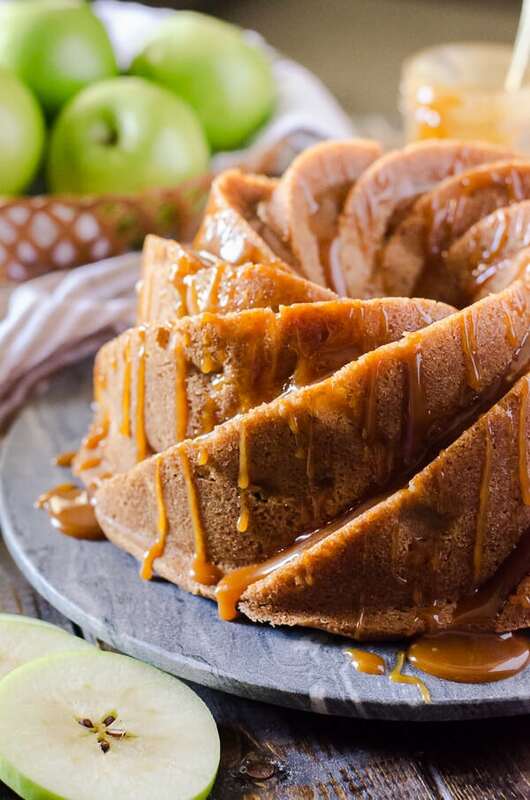 Pour 1 cup of caramel sauce on top of the cake and use a spatula or knife to spread it to the edges, allowing it to drip down the sides. Decorate as desired with gingersnap cookies. Heat sugar and water in a medium saucepan over medium heat, stirring to moisten all of the sugar. Let the sugar simmer until it begins to melt into a golden-colored liquid, stirring occasionally. Once sugar is completely melted, immediately but carefully stir in the butter for 2-3 minutes until completely melted. The sauce will bubble rapidly. Slowly drizzle in the heavy cream, continuing to stir. The mixture will once again bubble and splatter. After the cream is mixed in, allow the caramel to boil for about 1 minute, then whisk until smooth. Remove from heat and whisk in bourbon, vanilla, and salt. Cool to room temperature, then chill for 15 minutes before using. In a mixing bowl, beat butter, cream cheese, and caramel sauce until well blended. Mix in powdered sugar, vanilla, and salt until fluffy. 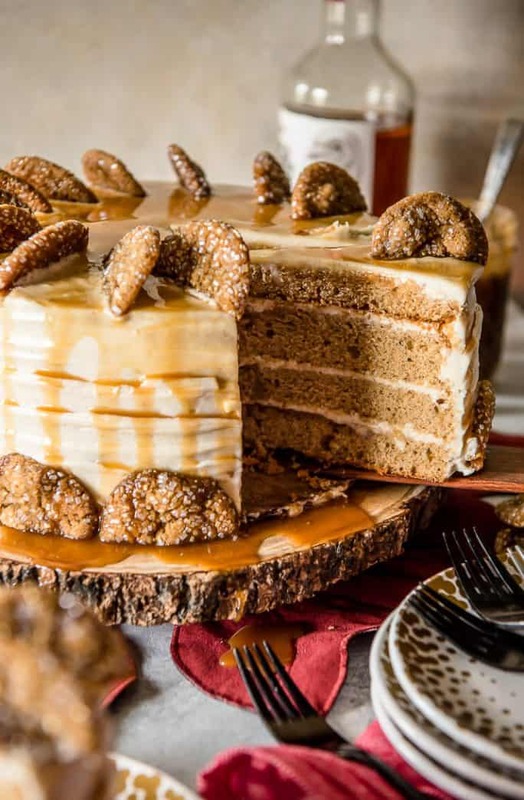 Does this epic Bourbon Caramel Spice Cake have you craving more cake? Try another delicious caramel-flavored treat!